Last night I had the opportunity to attend my first car race: the NASACR Nationwide Series ToyotaCare 250 at the Richmond International Raceway in Richmond, VA. Up to this point in my life, I’ve never been particularly interested in NASCAR-style auto racing; I’ve always preferred European-style Grand Prix racing, and even then it’s more about the scenery and the track than it is about the cars and drivers. 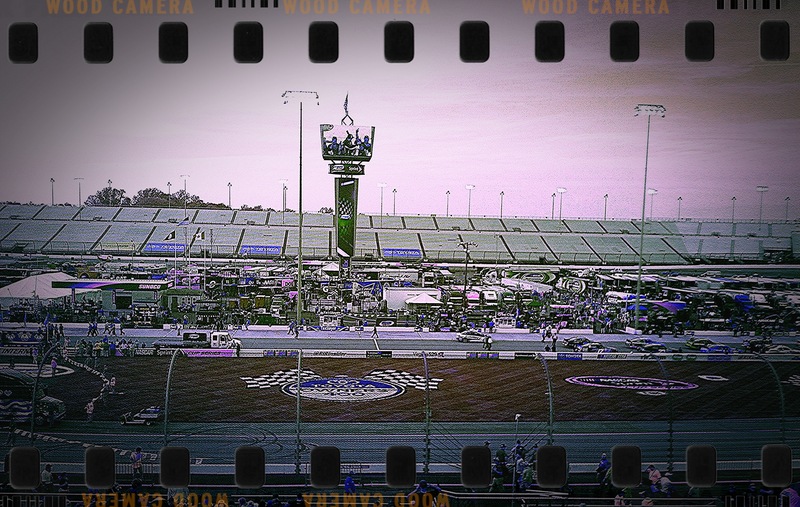 Nevertheless, when my father-in-law asked if I’d like to go to this particular race, I said yes for three equally compelling reasons: I didn’t have to pay for the tickets, I’d get a day off from work, and my wife (who is an avid NASCAR fan) would finally – after about 8 years – get to attend another race. We drove the four-plus hours to Richmond with little excitement. When we arrived, the parking lot was much like the minor-league baseball games I’ve attended: a large empty field with workers in reflective vests directing drivers where to park. A piece of advice for those that haven’t been to an event like this before: remember to look at the lot numbers when you park, it’ll save you some trouble later on. After making the short trek to the entrance, I began to smell the smell of racing. Every sport that I’ve come in contact with has a particular smell: running events generally smell of perspiration and – for some reason unknown to me – plastic; basketball smells of leather, soccer does as well, and if it’s been raining, wet dog, too; baseball games smell of popcorn, peanuts, and cheap beer. This race smelled of something I’ve never encountered at a sporting event, and it was wonderful. To me, the smell of racing is a mix of hot rubber, metal as it’s under a welding torch, sweat, and that wonderful mix of food smells that you normally find on the midway of a state fair. (It also smelled a bit like the period of time when I worked with a chain-smoker making cutting edges for snowplows, but that’s okay). Then there were the people. For the last two weeks I’d been told that racing fans were some of the nicest – if somewhat inebriated – people I’d ever meet. I admit I had a hard time believing this. In my experience, sports spectators don’t get along, and alcohol only makes this situation worse. The only sport I’ve personally attended where all opponents actually get along is at the marathons that I’ve run. However, I must admit that I was wrong in my assumptions. Even while three sheets to the wind, the fans around us were nice and willing to engage in a good bit of rivalry that didn’t extend beyond the last lap of the race. The same could not be said of the drivers and their pit crews, two of which began fighting each other immediately after the race due to a somewhat minor altercation in the last 15 laps of the race. There’s actually very little to say about the race itself. It consists of several hours of a couple dozen cars traveling at 115+ mph in an oval pattern. It’s incredibly loud, but in a pleasing way. 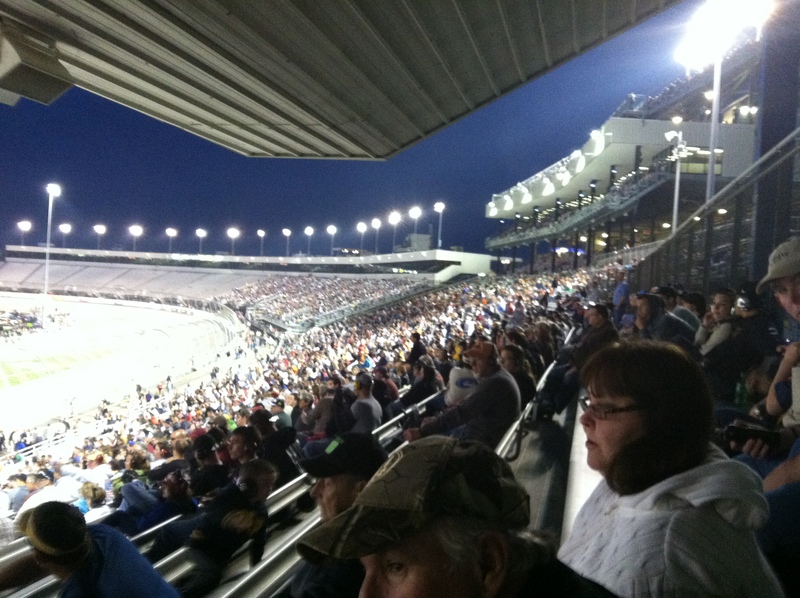 Our seats were situated so that we could see every inch of the track, and therefore every accident as well. There were only a few spectacular wrecks during the race: one car blew a gasket and spread oil over the whole track, causing a delay and eventual stoppage of the race; several cars blew tires and sent the race into caution while they made it to the pit and the chunks of rubber cleared off the road; the most unfortunate wreck was when the crowd favorite was hit from behind and sent into the wall in the last 25 laps of the race, effectively ending his decent chance at victory; and the stupidest driver was the driver of car 01, which smoked for two laps (with no caution) before pitting, then continuing to smoke for another two laps (under caution) after pitting, and then refusing to pull out of the race for two more laps after being told by the officials that he must do so. Everyone cheered when this last guy finally got the hint and left the race. I was told that the only real rule of watching a car race was to pick a driver and cheer for him loudly. Since I had no clue about who any of the drivers were, I picked the guy who was driving the car with my favorite number, number 32 (I later found out his name is Kyle Larson). He ended finishing the race in 8th place. Overall, I had a great time and would probably go again, provided I don’t have to pay for tickets.